Miles Kelly is an independent children’s book publisher that covers everytime of book from fiction, non fiction, activity books and sticker books. They really have a wide umbrella of titles, something for everyone. 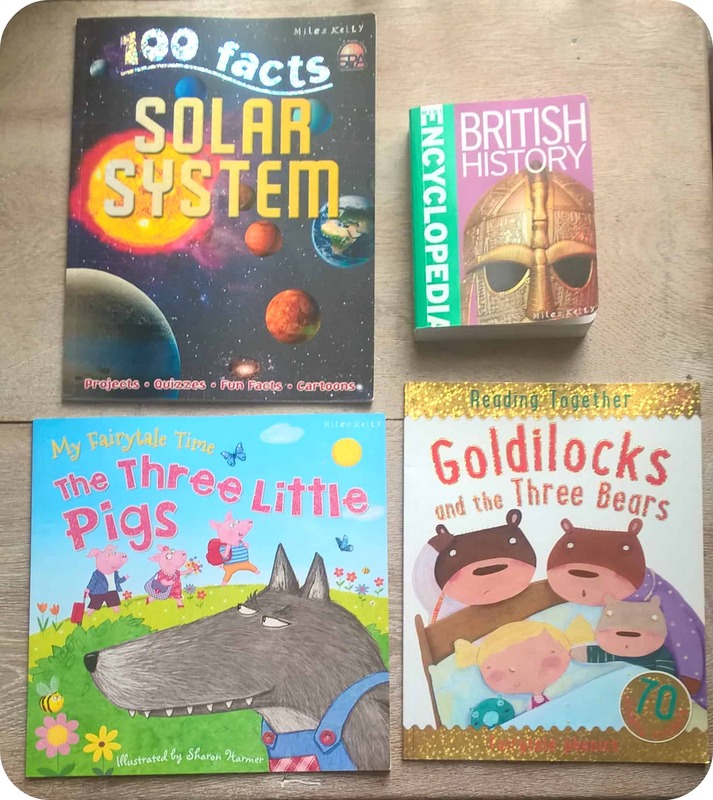 We received a selection of books suitable to my children’s ages to try out and I have to say we were impressed by them all. They are are of an excellent quality and my children were eager to get reading when they saw them. Miss M starting looking through the 100 Facts Solar System and recalled some things she recognised from learning at school last year. 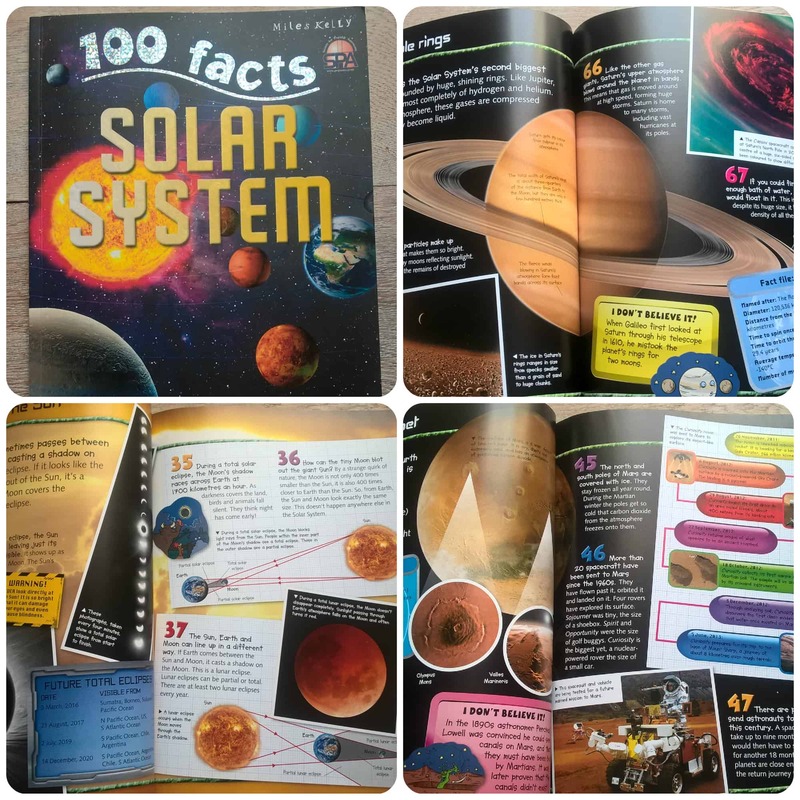 Each page of this book is full colour and packed full of annotated pictures and fact files whilst going through 100 interesting facts about the solar system. Going through the book with her, we found some facts that turned into quite fascinating talking points which even my young son enjoyed listening to and making sounds/actions to, demonstrating the points we were discussing, such as meteorites being blasted out of the surface by other rocks smashing into them! I think it’s great when children can take in snippets of information from books like this as you know it’s something that they will remember. The book is fun to look through and you can read as much or as little as you like at a time. There are short quizzes dotted throughout the book to test your knowledge of the pages you’ve just read which is always fun when you are going through the book together, encouraging children to want to learn so they get the answers right. 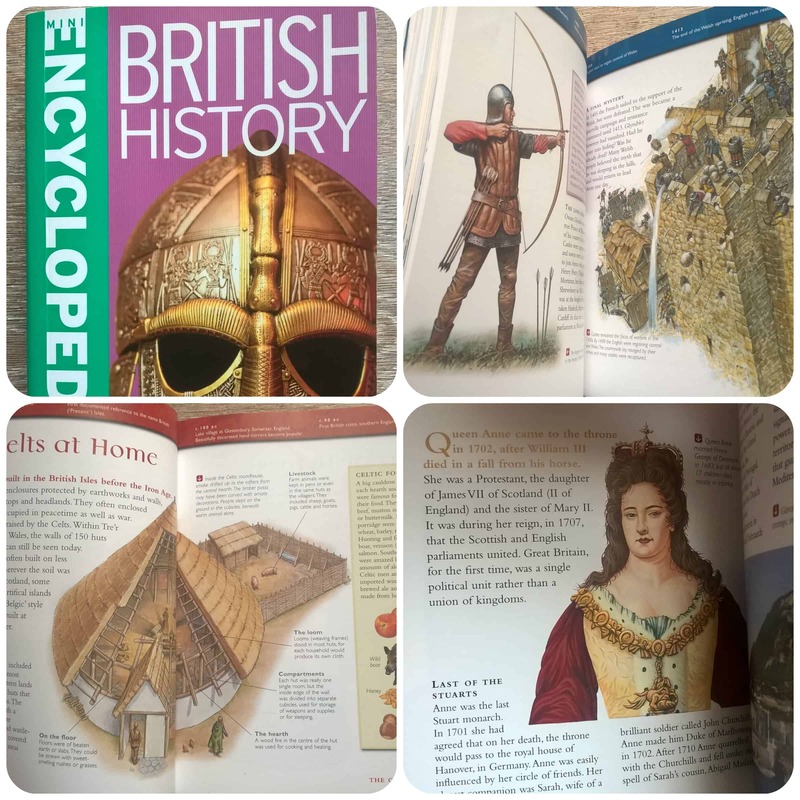 The book that really grabbed Miss M’s attention is the mini Encyclopedia of British History, although surprising, I knew she would be interested as she is currently learning British History at school and really does have an interest in seeing things outside of school that are relevant to what she is learning. She immediately sat flicking through this book and seemed quite engrossed, but she had come across the era that all her homework is based on this term, Stone Age, Iron Age and Bronze Age. She found a great labelled picture of a round house from which she used the information for her own drawing of a round house which she had to label. And she was really inspired about the Iron Age hill forts and got lots of ideas for the model she had to make for one of her school assignments. This book gives a fascinating journey through time in Britain from the era where woolly mammoths existed right up to the 2012 London Olympics. With just short of 400 pages this mini encyclopedia is packed full of infomation in short bursts of paragraphs and facts with lots of colour illustrations to engage the reader. Reading Together Goldilocks and the Three Bears is a brilliant story and activity book for those just starting to read. Mister B started school this year but his reading is already progressing well and this book has been great for him. Not to mention Goldilocks has been a topic at school this term! 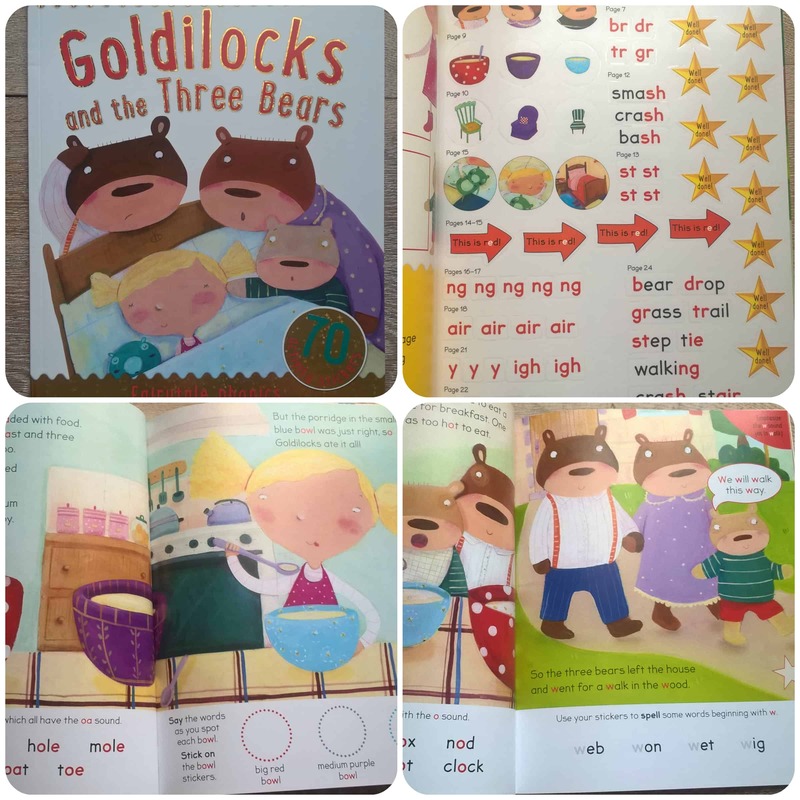 The book follows the story of Goldilocks along illustrated pages but at the bottom of each page are some words for your child to read related to words or sounds in the story. There are 70 stickers to use within the book encouraging children to learn their phonics and find the right ones for each pages activity. This really engaged Mister B and made the learning fun and is different to other phonics based activity books I’ve come across. 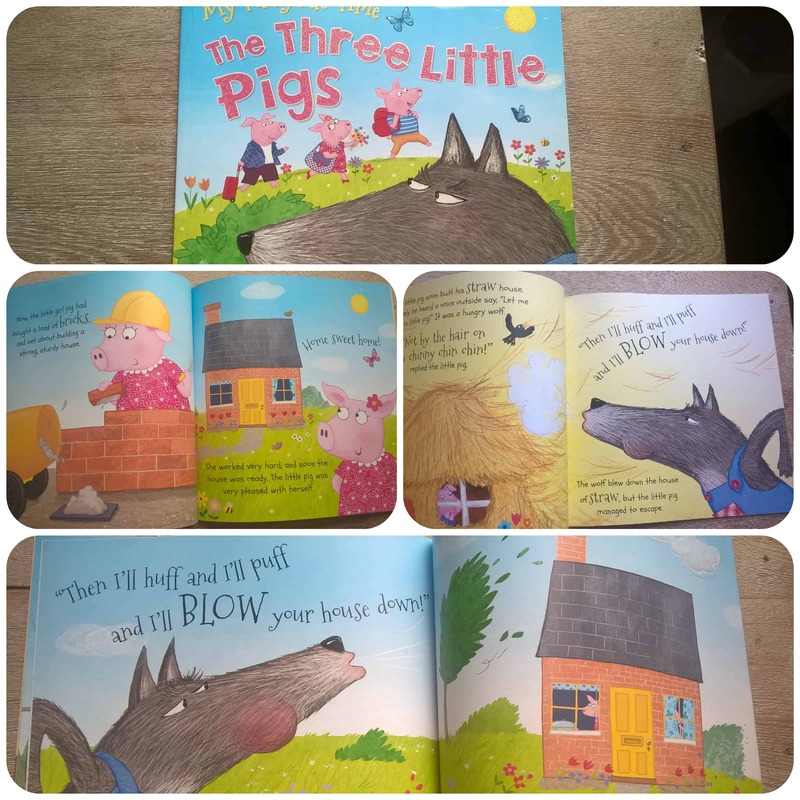 Our final book is The Three Little Pigs, a picture book for young children. A lovely size with full colour pages that are beautifully illustrated, this is an excellent rendition of the traditional tale. The pictures are fun and engaging, with plenty for young children to look at, point at and tell you what they think is going on in the story. I know Mister B loves giving his version of the a story’s events before I read a page, showing that he’s engaging to what he’s listened to previously. Overall I think the Miles Kelly books are of excellent quality and full of engaging content for children. They are beautifully put together and there is such a wide variety of books available to cover each child’s tastes that there really is something for everyone. My children have thoroughly enjoyed these books, and this is definitely a publisher that I’d recommend. All reviews are my own and my family’s opinions and we received the books in order to write an honest review.